Since we were little children, our parents have continually nagged us to brush our teeth daily, only to be reinforced by visits to the dentist and the constant marketing blitz of oral care products that are supposed to give us better breath, stronger teeth, healthier gums, and whiter smile. 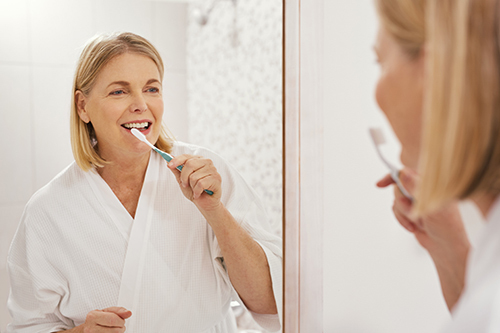 While all this advice should be taken seriously, at the very least for proper hygiene, there may be an even more important reason to keep your gums healthy—to decrease the risk of cancer. In recent years, research has shown that periodontal disease is a risk factor for certain cancers, including breast, oral, and esophageal cancers. Yet, few studies have analyzed the overall risk for all types of cancers. The SUNY Buffalo team assembled a prospective cohort study of 65,869 women aged 54 to 86 who were enrolled in the Women's Health Initiative Observational Study. Using questionnaires administered between 1999 and 2003, study participants self-reported on their periodontal disease history. The researchers evaluated cancer outcomes through September 2013. Using an average follow-up time of 8.32 years, the researchers had identified 7149 cases of cancer. Analysis of all the data showed that a history of periodontal disease was associated with a 14% higher risk of developing any cancer. “Our study findings serve to provide further evidence that periodontal disease is linked to cancer and support the need for further investigation into how periodontal disease contributes to increased cancer risk,” remarked lead study investigator Ngozi Nwizu, Ph.D., assistant professor of oral and maxillofacial pathology at The University of Texas School of Dentistry. Though the strongest association uncovered was for cancer of the esophagus—which was more than three times more likely in women with periodontal disease—lung cancer, gallbladder cancer, melanoma, and breast cancer were also associated with significantly higher risk. The researchers noted that certain cancers, such as breast, lung, and gallbladder cancers, were associated with higher risk in women who smoked and had periodontal disease. Interestingly, however, other cancers such as melanoma, were associated with higher risk in the women who had never smoked but did report periodontal disease. “The esophagus is in close proximity to the oral cavity, and so periodontal pathogens may more easily gain access to and infect the esophageal mucosa and promote cancer risk at that site,” noted senior study investigator Jean Wactawski-Wende, Ph.D., a professor in the department of epidemiology and environmental health and dean of the School of Public Health and Health Professions at SUNY Buffalo. Although the investigators felt confident about their findings, they did note that since the study utilized self-reported data, the prevalence of periodontal disease may have been underreported. Moreover, while the study’s large size strengthens the researcher’s findings, they added that further research that uses more precise assessments of periodontal disease could be useful in confirming the link between periodontal disease and cancer.